One of the largest nebula in outer space, the Carina Nebula, has been imaged by the VLT in very fine detail with the help of its new camera, the OmegaCAM. A nebula is a cloud of gas and dust in interstellar space. Most nebula are formed when surrounding dust and gas collapse into each other due to its weight and gravity. As these gas and dust collapse into each other, new stars are formed. Other nebulae are formed when a star reaches the end of its life and explodes into a supernova. Ionized gas and matter are ejected by the supernova as it explodes and a neutron star usually is formed in the middle of this type of nebula. Nebulae glow in different colors depending on the type of gas surrounding them. Hydrogen gas, for example, emits a reddish glow while ionized oxygen has a greenish glow. 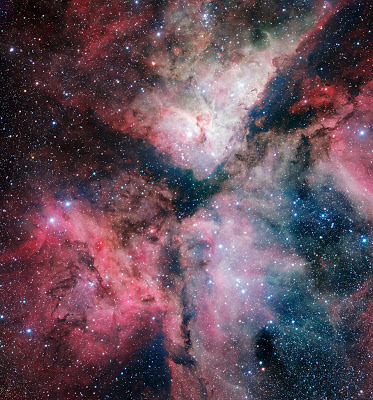 The Carina Nebula glows red as imaged by the VLT. Nebulae are bright and emit a glow because of the ionization of the surrounding gas by ultraviolet radiation. Ultraviolet light is invisible to the naked eye but this type of energy ionizes the surrounding gas which makes it light up. This is similar to the process of a fluorescent light tube. In a fluorescent light tube, mercury atoms are heated up which makes it emit ultraviolet light. The ultraviolet light then excites the phosphor coating inside the tube to light up (a chemical that can emit light). The latest telescope at ESO's Paranal Observatory in Chile — the VLT Survey Telescope (VST) — was inaugurated today at the Italian National Institute for Astrophysics (INAF) Observatory of Capodimonte, in Naples, Italy. The ceremony was attended by the Mayor of Naples, Luigi De Magistris, the INAF President, Giovanni Bignami, the ESO representatives Bruno Leibundgut and Roberto Tamai, and the main promoter of the telescope, Massimo Capaccioli of the University of Naples Federico II and INAF. The VST is a state-of-the-art 2.6-metre telescope, with the huge 268-megapixel camera OmegaCAM at its heart. It is designed to map the sky both quickly and with very fine image quality. The VST is a joint venture between ESO and INAF and OmegaCam has been provided by the OmegaCam consortium . This new telescope is the largest telescope in the world exclusively dedicated to surveying the sky at visible wavelengths (eso1119). The occasion of the inauguration has been marked by the release of a dramatic picture of the Carina Nebula taken with the new telescope. This object was a natural target when the President of Chile, Sebastián Piñera, accompanied by the First Lady, Cecilia Morel, were distinguished guests at the Paranal Observatory on 5 June 2012 and participated in observations with the VST. The picture that the President helped to take on this occasion has now been combined with other recent VST images of the Carina Nebula to produce one of the most richly detailed and colourful views of this object ever created. The Carina Nebula is a huge stellar nursery lying about 7500 light-years from Earth in the constellation of Carina (The Keel) . This cloud of glowing gas and dust is one of the closest star formation regions to the Earth and includes several of the brightest and most massive stars known. The Carina Nebula is a perfect laboratory for astronomers studying the violent births and early lives of stars. The conspicuous red colour of the picture comes from hydrogen gas in the nebula that is glowing under the harsh ultraviolet light from many young and hot stars . Other colours, originating from other elements in the gas, are also visible, as well as many dust clouds. Just above the centre of the picture lies the bright star Eta Carinae (eso0817). This huge and highly unstable star brightened dramatically in the nineteenth century and is a good candidate for a future supernova explosion. The VST programme was a joint venture between the INAF–Osservatorio Astronomico di Capodimonte, Naples, Italy and ESO. INAF designed and built the telescope with the collaboration of leading Italian industries and ESO was responsible for the enclosure and the civil engineering works at the site. OmegaCAM, the VST’s camera, was designed and built by a consortium including institutes in the Netherlands, Germany and Italy with major contributions from ESO. The new facility is operated by ESO, which also archives and distributes data from the telescope. For further details please refer to eso1119. The special filter for observing hydrogen emission was kindly made available by the VPHAS+ Consortium.